There are certain scents that conjure up images of home when I was growing up: the traditional Easter yeast bread rising and then baking in the oven, fresh sheets pulled from the line still smelling of sunshine, the smoky warmth of logs burning in a fireplace on a cold fall night in Buffalo. I love those scent memories. The problem is that I don’t bake much (outside of that Easter bread I faithfully make once every year! ), I don’t dry clothes on a line, and fireplaces get minimal use in Arizona. But I still want those scents greeting me when I enter the kitchen or lingering in the halls as I’m walking to another room. So I admit that I take the shortcuts of our facsimile age. Enter candles, oil warmers, and other “home fragrance” scents and gadgets that I obsess about nearly as much as I do personal fragrances. The scent is Philosykos for the home, and as I noted in my first post on this blog, Philosykos is one of my all time desert-island faves. Fico Verde (Green Fig) is a grassy, figgy, sweet-bitter green scent; the Antica Farmacista website (http://www.anticafarmacista.com/) describes the notes thus: “This scent begins with fresh green notes of cut grass, luscious notes of fruit and soft violet, then softly envelopes you in the sweetness of wild fig. A finishing drydown of powdery sandalwood round [sic] out this harmonious scent.” Green Fig conjures up for me the scent memory of relaxing with a glass of homemade lemonade near a fresh cut lawn on a summer day. It’s perfect for this time of year when the temps are rising, the windows are open, and I want the house to smell (if not actually be?!) fresh and clean. The fragrance is offered in one of those “sticks in a glass bottle” forms that are ubiquitous at the moment, and I have to admit I like the concept—it’s scent distribution that requires no flame or electricity and has the added bonus of looking pretty. Antica Farmacista’s bottles and labels are classic apothecary styles that would fit in most décor schemes, and Fico Verde is a pleasing light green liquid that blends with seasonal decorations and arrangements. Since I purchased the large version of the scent, I’m buying a few extra small pretty glass bottles and splitting up the included looooong birch sticks so that I can spread my scented joy around more of the house. And the clincher for me: the “throw.” Fico Verde is not overpowering, but it’s not a shy scent, either. I’ve tried a variety of the diffusers, from cheap to expensive, with mixed results. Fico Verde nicely scents up a room and the adjoining hallway in my home, and I don’t find I have to turn the sticks more than once per week to keep the scent strength consistent. I’m a little afraid that this ended up more like an ad than a review—sorry about that!! Perhaps readers can help me out by sharing: What scents conjure up “home” for you? Any favorite ways of fragracing your home that you would like to share? 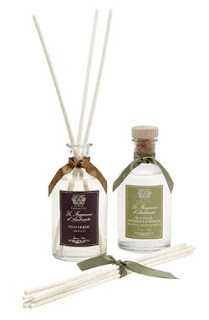 Image of Antica Farmacista Home Fragrances courtesy of beautybentobox.com. Green figs courtesy of jupiterimages.com. Antica Farmacista rarely offers discounts and it is the most amazing product in the world! They have a promotion until December 7, 2008 of 30% off all online purchases (type in Antica30 at checkout). Go to www.anticafarmacista.com. Yikes - I have to disagree slightly. I don't think these scents are as strong, I wonder if these posts are by the company? I prefer Agraria (can't remember how to spell it). There are so many of these kind of "home ambiance" things now with the reeds sticking out, I think there are better bargains available! This blog is my love and quite personal. Therefore, to even think that I would allow a post of promotional nature from the manufacturer is ludicrous. This was written by my dear friend Camille and while you may disagree, she clearly loves it!